Home Uncategorized How Do You Get the Most Out of Fairs and Exhibitions? How Do You Get the Most Out of Fairs and Exhibitions? In amongst the sprawl of guests, exhibitors at stands and champagne, it is very common to feel a little bit lost at large fairs and events. Preparing your ideas and having a good read over the agenda of the week are just do of the things you should be doing before one of these events. Read on to find out some more of our ‘pre-event’ tips. Spend 15 minutes before you go noting down the location and time of all the events, demonstrations and talks that tickle your fancy. Even if there is a clash with other appointments, such as a meeting that you scheduled with a client, you may be able to attend other events before/after. Equally, if your meeting were to be postponed, you would know exactly where to go for your talk! It doesn’t take that long to organise your day but you will definitely be grateful for it when you are there. – Are the “big names” in your industry on the list? Where can you find them? 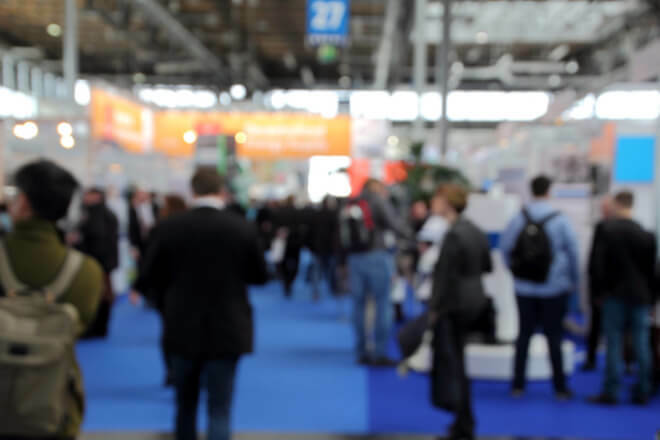 Fairs and conferences provide you with many opportunities, however, you cannot embrace them all and so one of your preparatory tasks is to really consider what you want to achieve and go from there. Are you looking for inspiring ideas for your business? Do you want to win new customers? etc. Your game plan will be different for each of these goals. In the first case, you will probably learn the most by attending talks on innovation and culture. The second objective would be best met by preparing your stand and focusing on speaking to as many passers-by as possible! Who knows when an important CEO will stop by to say hello? Before, during and after the event! Look out for official hashtags on Twitte, Instagram and LinkedIn. Share your ideas and hear what others are talking about- it is a great way to get in touch with new people. Graphic materials are important but they are not everything. Roll-ups, brochures, business cards… everything helps to tell the story of your company and your product. But they should not be the main attraction of the stand. The great advantage of being in a fair is talking to visitors and other exhibitors. Focus on what you’re saying not on how you’re saying it! And don’t forget: follow up is essential. Take a few hours after the event to follow up on the people you met and exchanged contacts. Whether you’re adding them on LinkedIn, sending emails with more information about your business, or just a simple “Hello!” message, anything makes a big difference. Next articleHow do you do Asset Management?